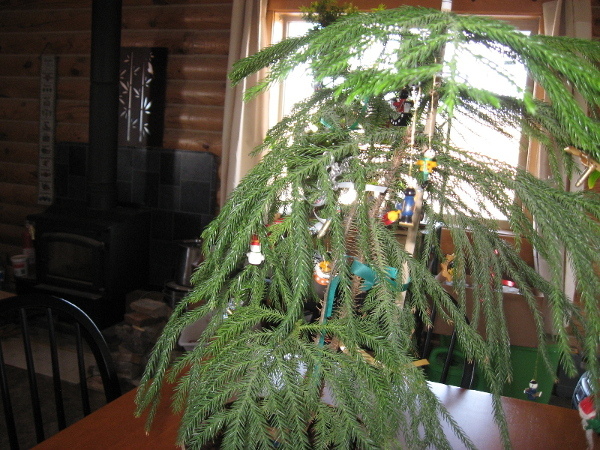 My Norfolk Island Pine house plant doesn’t make for a very traditional Christmas tree, but that’s the most effort I’m willing to make anymore. The children are long gone, and with all of the problems and terrors we face most days, a “Merry Christmas” just doesn’t seem to be in the cards. I share the story of one special Christmas every year now, however, and it never loses its significance. Seems we need to be reminded that the “old days” were never perfect and had their own problems and terror… My Perfect Christmas. 1950 was a hard year. My father died and my mother was left with two small children. She was a “housewife” and had no particular marketable skills. She also didn’t have any family who could help her much. She was a recovering alcoholic and suffered from severe depression. Not a pretty picture. This, of course, was long before the social workers, welfare, food stamps, WIC, or any of the alphabet soup government offices and “programs.” All she had was her faith in God and her children, the few friends who stood with her, and the understanding that it was her responsibility to raise her children and get on with life the best she could. This entry was posted in Mama's Rants. Bookmark the permalink. 4 Responses to Happy Holidays! Sorry to be late to the party, as it were. I just now have read this beautiful story, and am also reminded of my Christmases as a child. Although we were never in such dire straits as you, we also did not buy into the huge commercialization that has swept the country today, nor did we decorate the tree until usually Christmas Eve. Even though my parents were not religious, they were the most hospitable people I have ever known. We lived in a small town, about 800 or so. It was not unusual to wake up with someone sleeping on the couch, or having breakfast with them. When I went through divorce at age 30, I moved in with them for a time, and as they had a huge 5 or 6 bedroom house in town, they still often had people stopping in for sometimes the night, or even one time a couple months. She was a waitress at the restaurant they owned in town and needed a place to crash for awhile. Once, while I was staying there, a young couple’s car broke down passing through town. I saw them, towed them to my folk’s house, and they camped out in a tent in the yard. The next day, a friend from next door fixed the car for them, they gave the friend money for the repair, my folk’s fed them, of course, refused money, and we sent them on their way. Such was life in small town America. I hope it is still like that, but I honestly don’t know. Much has changed. Even myself. It makes me sad, especially for my children. Thanks for stopping by! 🙂 I live in a “small town” now, and I have so many good neighbors. Good memories. Same to you and to Mama Liberty, My your G-D bless and watch over both of you.